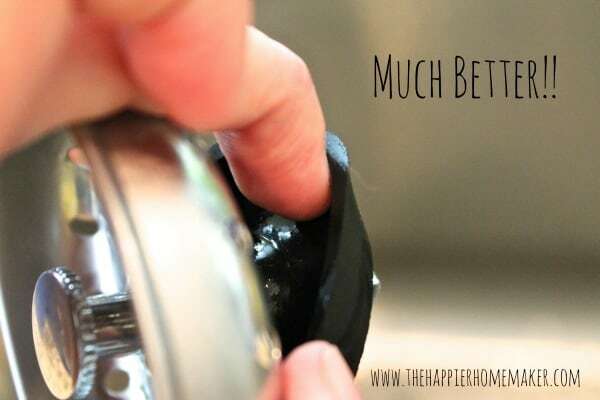 Love the idea of throwing lemons in the garbage disposal! Mine is pretty foul right now too and I never quite know what to do about it. I’m trying this one for sure! Great tips! I can’t wait to try this today!! Yeah…you’re definitely not the only one! 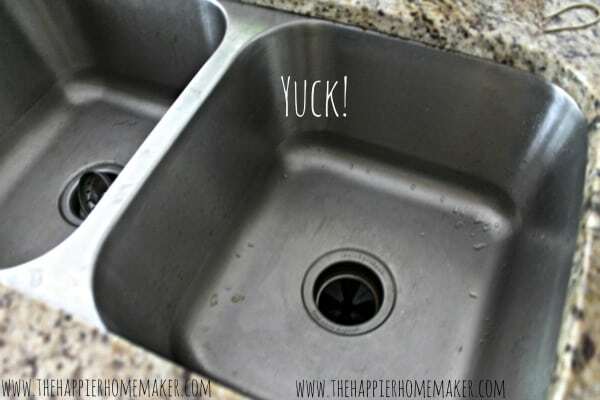 We don’t have a garbage disposal in our apartment, so we have drain stoppers in both sides of our stainless steel sink, and you’re right, that one spot is DISGUSTING! I feel like I clean those suckers weekly and they just get bad again right away! 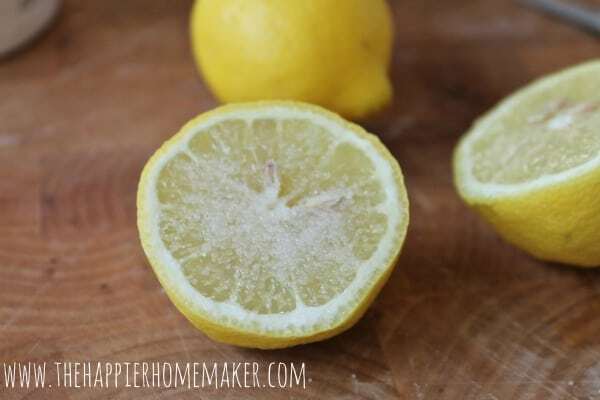 I use the baking powder/vinegar trick, but had never heard of the lemon/salt trick. Love it! SO glad you shared, as my sink gets grungy too! Thanks! I hope it helps, it worked great for me! Wonderful…will give this a try for sure! GENIUS!!! I have never seen that trick salting the lemon! Thanks Jocie-it works really well!! 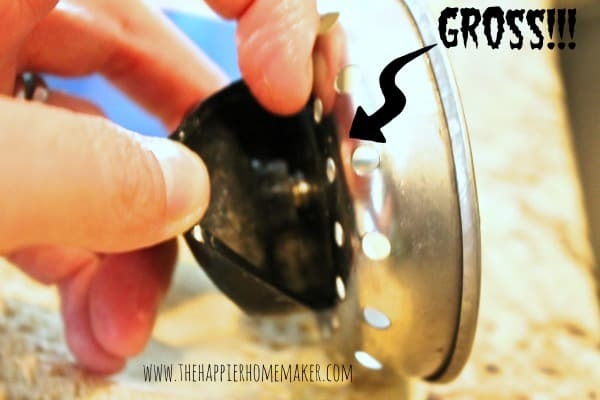 For inside the garbage disposal may I recommend using a sponge on a handle to clean it. The ones that are cut into sections from the Dollar Store. I wet the sponge and add baking soda then scrub the inside of the flap, sides and the bottom . Rinse the sponge then continue with vinegar on the sponge to sanitize. Great tip, thanks!!!! I’m definitely going to try that! GREAT idea. makes it easier to get under the rubber fins. Also, I put my sink stopper in the dishwasher AT LEAST 1-2 times a week to keep it sparkling clean. You may want to do the suggested cleaning here to make sure you are not putting crud in with your dishes. Once clean, the dishwasher will maintain that clean! I’m way behind the curve on this one, but I’m always looking for new “recipes” for smell-goods at home. One of my faves is sliced lemon (with a little bit of the peel zested in), vanilla extract, and a few sprigs of rosemary. Simmered on low on the stove. Smells amazing! Probably it’s because of my job, but I really pay a lot of attention to cleaning and deodorizing. Thanks for this. I use vinegar and baking soda for most cleaning but the lemon and salt scrub is new to me. 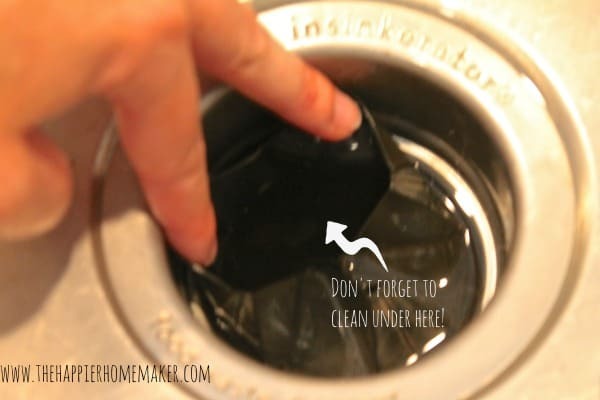 So is the cleaning of the sink stopper – it never occurred to me. Do you have any secrets for naturally cleaning an oven. The importance of home plumbing becomes magnified when you buy a new home. There are many people who confront various plumbing problems soon after they buy their dream home. You can sanitize your wooden cutting board with salt and lemon. Just sprinkle coarse salt over the board and scrub with half of the cut lemon. Gets out garlic and onion smell! Amazing advice!!! 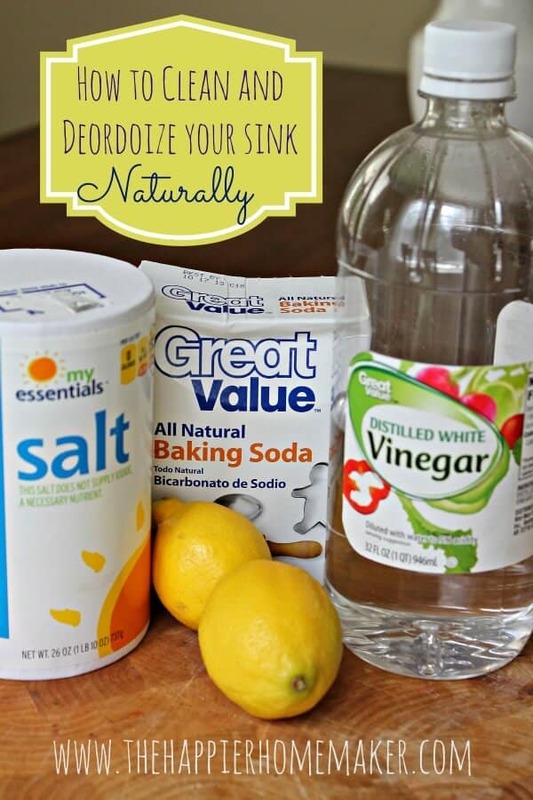 We have been dealing with sink stink and nothing I’ve tried has worked. I feel totally dumb because it never occurred to me to clean under the rubber disposal skirt! That could have been the culprit right there -it was disgusting! I’m taking the advice from another writer to use a sponge on a handle the next time I do this. And I will be doing this again, regularly. It’s so easy, and leaves everything smelling fresh. Thank you! I was so grossed out the first time I saw the under-the-rubber nastiness too Monica-it’s SO disgusting!! These ingredients beat anything else. And there are no harmful effects on your family or anything you put in the sink. 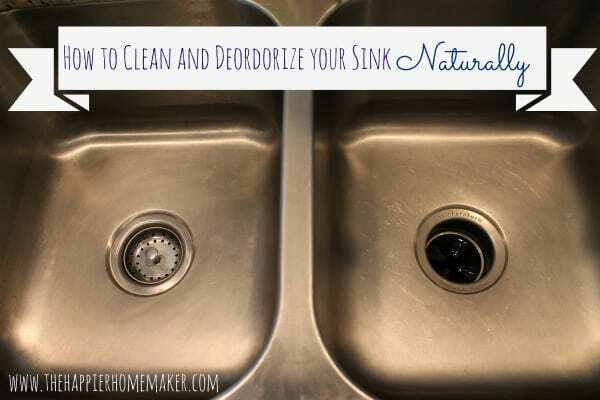 There’s nothing worse than a smelly sink, except two smelly sinks together. (Also, sorry to be a smartie pants but I can’t not say anything – you have a major spelling mistake at the start of this page in the photo of all the ingredients – look at ” deordoize “). Thanks!! I saw the misspelling but I can’t change the picture now without breaking all the pins on Pinterest! So I’m stuck with a typo from 2 years ago!! LOL Melissa. And now I’ve brought attention to it all over again. Sorry. I should learn to just mind my own business. I pop the plugs into the dishwasher every so often – it gets them sparkling clean. Also, the disposal skirt pops out. You might have to tug on it a bit, but it’s not attached to the sink. I put that in the dishwasher, too.